When you negotiate a contract with a supplier the terms of the contract specify details such as the quantity to be purchased, pricing, discounts, and delivery instructions. The contract will also contain clauses on what the procedure is to cancel the contract for certain reasons. The contract is a legal document that protects the interests of the customer and the supplier and is legally binding on both parties. 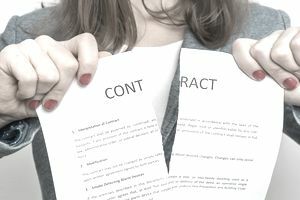 The clauses in the contract relating to termination of the contract should be closely examined so that there are no surprises when the contract is terminated by one or other of the parties. The contract will stipulate how the contract can be terminated by either party and the clauses relating to termination will determine the steps to be taken. Sometimes there are penalties attached to early termination and these should be clearly understood. Most contracts end when the validity period of the contract has expired, and in many cases, the contracts are renegotiated and renewed. However, there are three distinct termination scenarios that may be specified in a contract. These are cancellation for default, cancellation by mutual consent and cancellation for convenience. Cancellation For Default - This is used by a customer when the vendor has failed to abide by the terms of the contract. Depending on how the contract is worded, the termination can be triggered by failure to adhere to delivery dates, or a failure to provide items with the level of quality required. Whatever the cause the customer should be able to provide evidence to substantiate the cancellation notice. Depending on the contract the vendor may have a period in which to address the issues, or if they disagree with the reasons provided by the customer, they can take their case to a mediator. Cancellation By Mutual Consent - In many cases the contract is terminated by mutual consent without any instances that trigger a cause. Sometimes the vendor stops production of a part used by the customer and therefore the contract can no longer be fulfilled. In other cases, the customer may no longer produce finished goods that require parts fulfilled by the contract. Cancellation For Convenience - Vendors have found that customers have canceled contracts for convenience due to the fact that they are in financial difficulties and do not want to be tied to a contract. If this termination occurs the vendor should not suffer any financial loss because of the actions of the customer. When a customer decides to terminate a contract for reason, for example if the quality of the items is not up to specification or the deliveries are never on time, the customer has to be wary that they have may have waived their rights. If a vendor sends their deliveries to the customer so that they are always late, and the customer has not complained about it, the customer could have waived their rights to terminate the contract. This is due to the fact that the customer has effectively accepted that the deliveries are always late and that at a later time they cannot then cancel the contract based on late deliveries. A customer can terminate the contract with a supplier if the supplier breaches the contract in one of a number of ways; late delivery, incorrect quality or specifications of items supplied, incorrect items supplied, or if the vendor says that they cannot deliver the items. If the vendor says that they cannot supply the items indicated in the contract the customer can find the same items from another supplier. If those items from the other supplier are more expensive then the customer can get reimbursement from the supplier who breached the contract. For example, if the contract price for an item is $10 and the alternative supplier charges $18 per item, then the customer can then recover the $8 per item extra they had to pay from the vendor they have the contract with. This is called remedy of cover.